During the February 2016 Grammy Awards, Hilton launched its “Stop Clicking Around” marketing campaign, its biggest ever in Hilton’s 97 year history. Just six months earlier, Marriott launched its ambitious “It Pays to Book Direct” campaign. For the past 2 years, major hotel chains in the US have aggressively accelerated their direct bookings push in an effort to get customers to bypass Online Travel Agencies (OTAs), mainly Priceline and Expedia. In theory, this would translate into more customers, more loyalty and a more profitable business altogether. In this post, I will look at different data points to understand if hotels’ direct-booking campaigns are trending up. I will then look at some of the elements that explain why OTAs continue to thrive, and will finish by suggesting some other initiatives that should be undertaken by hotels. Is the hotel direct booking push working out for hotels? What’s behind OTA’s continued success? 1. Is the hotel direct booking push working out for hotels? Let’s take a look at a few available indicators for two major US hotel chains that are at the forefront of this direct booking push — Hilton and Marriott — and the impact on the two leading OTAs: Priceline and Expedia. 1.1. 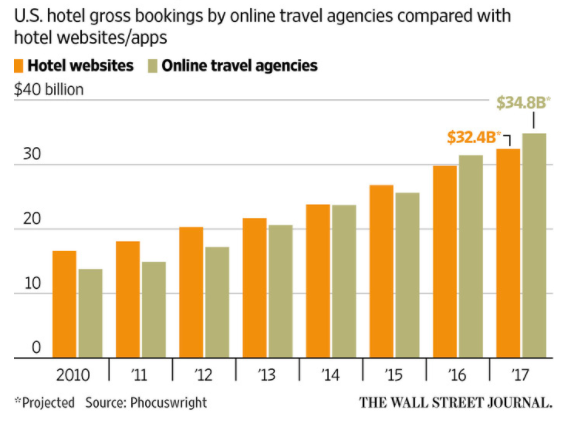 US hotel online bookings: OTAs vs Hotel web/app. 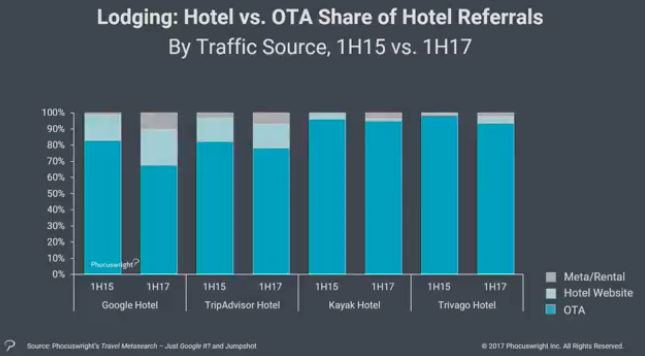 If the hotel’s marketing push to get consumers to book direct was working, we would see consumers’ US online hotel bookings shift away from OTAs in favor of hotels. Not only didn’t OTAs lose share to hotels, but OTAs accelerated their share growth and surpassed hotels in US hotel online gross bookings in 2016 and 2017. 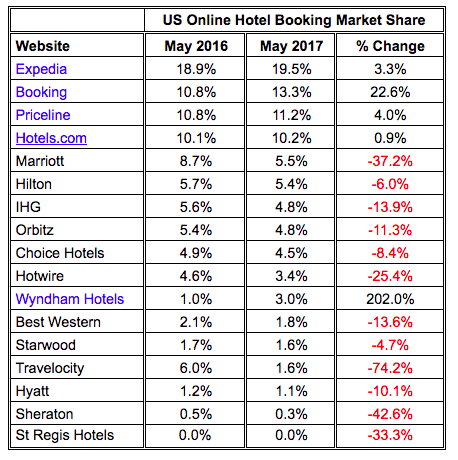 From this Skift analysis, we can see that only 5 websites out of 17 gained market share in US hotel bookings from May 2016 to 2017. 4 out of the 5 websites are OTAs. The one hotel provider that gained share, Wyndham Hotels had a strong growth but still from a very small market share base. Booking.com had a strong year over year growth of 22%. Marriott and Hilton had decreases of 37% and 6% respectively. A negative impact on OTAs by these campaigns would be reflected in a slowdown of room nights starting in Q3 2015. → This is not supported by the data. 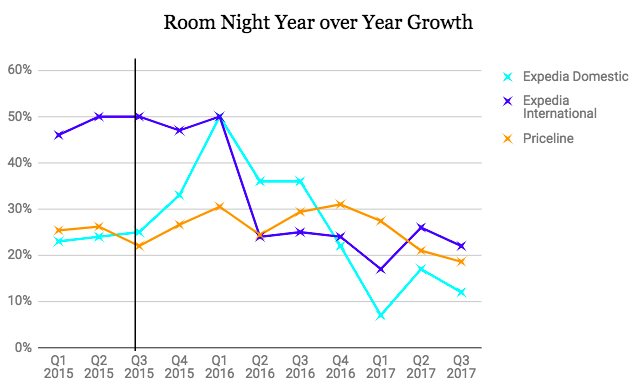 Looking at Expedia’s room nights, we see that year over year growth actually accelerates from Q3 2015 (25%) to Q1 2016 (50%). It then slows down to the current 12%. However, we can also see this downward in Expedia’s international room nights, so we cannot confidently attribute it to the hotel’s direct booking push in the US. Priceline’s data (don’t have the domestic vs international breakdown) shows an consistent and accelerated growth from Q3 2015 (22%) to Q4 2016 (31%), and then down to 19% in Q3 2017. Hilton and Marriott’s push for direct bookings should show an increased growth in US hotel room occupancy (as a result of increasing the number of direct bookings, while still maintaining other customer acquisition channels) starting in Q1 2016. 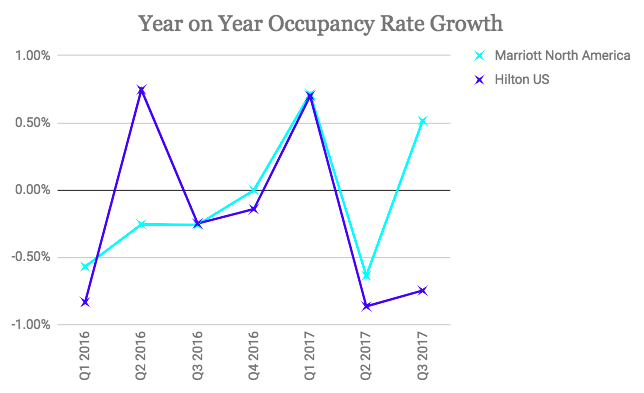 Year over year US occupancy rates from Q1 2016 onwards from Hilton and Marriott do not show a consistent occupancy improvement. Actually, there are more quarters with year on year decreasing occupancy rates than with occupancy rate growth. Hotel’s aggressive campaigns to generate direct bookings should show an increase in google searches for their hotel brands (a common entry point for direct bookings) in 2016 vs 2015, if all else remains unchanged (which never does). I looked at Google Trends data for searches in the United States for “Hilton”, “Marriott”, “Expedia”, “Hotels.com”, “Priceline” and “Booking”. 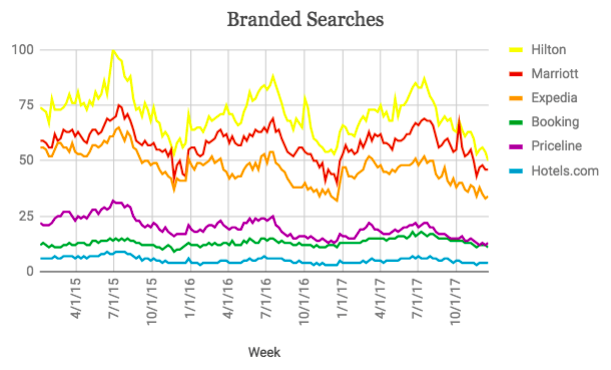 The first chart shows an evolution of searches for those terms from January 1st 2015 to December 20th 2017. The second chart shows a quarterly year over year change in search behavior. Hotel brands are more searched than OTA brands. Branded searches for Hilton and Marriott decreased in all 2016 quarters vs 2015. Priceline, Expedia and Hotels.com decreased in 2016 too. Booking was the exception, with two quarters with a slight decrease and two quarters of growth. 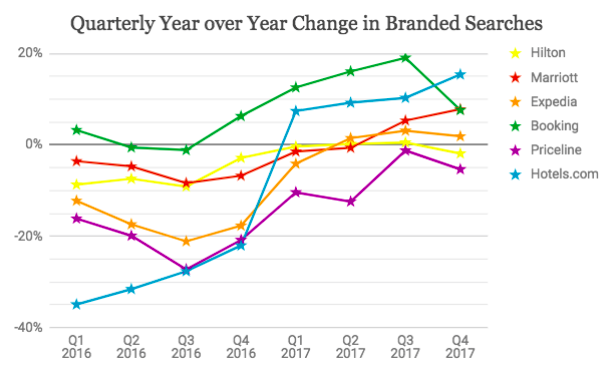 In all quarters in 2017, branded searches for Hilton were year over year flat or negative. Marriott was flat in Q1 and Q2 2017 and grew 5% and 8% in Q3 and Q4. Booking (Priceline’s primary hotel OTA) and Hotels.com (Expedia’s primary hotel OTA) had solid year over year growth in branded searches in all quarters in 2017. Expedia had marginal growth in 2017 while Priceline had the strongest year over year decrease in all quarters. → Branded searches in the last 3 years do not reflect a growing interest from consumers to search for Hilton and Marriott. They do show a very substantial growth for Booking.com during the entire period and for Hotels.com in 2017. Google Trends data. Numbers represent search interest relative to the highest point on the chart for the given region, time and set of search terms. A value of 100 is the peak popularity for the term. A value of 50 means that the term is half as popular. Compiled taking Google Trends daily data, taking the average for a given quarter, and then doing a year over year % change. 2. What’s behind OTA’s continued success? The hotels’ direct-bookings marketing campaigns do not seem to have slowed down OTAs. Several elements underline OTA’s strength. → In terms of number of properties, Marriott has 0.5% of Booking.com’s. There is a higher likelihood of a customer finding the right product in an OTA than in a hotel website, which translates into a higher conversion rate. This better conversion rate has a big impact on OTAs ability to invest profitably on Google and other customer acquisition partners. Expedia invested $4.3 billion and Priceline $3.8 billion in marketing in 2016. Hotel suppliers cannot compete at this scale. Skift estimates Marriott’s annual marketing spend in 2015 at only $100 million. In 2016, Marriot only spent around $1 million in its high visibility “It Pays To Book Direct”, according to a report. In Search Engine Marketing, scale and range of campaigns matter a lot. In non branded search, OTAs will always dominate suppliers because of their larger inventory and larger scale campaigns which drive critical mass. Even in branded search (searches that include a hotel name), OTAs also have a very prominent position. Another important customer acquisition channel is metasearch. Here too, OTAs dominate. The vast majority of hotel metasearch clicks are going to OTAs, not suppliers. → OTAs are best in class online marketers. They have the talent, track record, scale, technology, critical mass and budgets to dominate real estate in search, metasearch and any other relevant online marketing channel. Very difficult for hotels to compete effectively against OTAs in online customer acquisition. OTA’s mastery of online marketing and customer acquisition brings them tremendous scale. According to data from Similarweb, from September to November 2017, the world’s largest hotel OTA (Booking.com) had 1137 million desktop and mobile visits. The world’s largest hotel chain (Marriott) had 97 million visits — 8.5% of Booking.com’s. The accommodations product category is becoming increasingly complex. It includes hotels, hostels, apartments, rental properties, villas, shared accommodations, etc. This is the environment in which retailers bring value: they aggregate product and offer it under one roof and with a great user experience. → Increasing pricing fragmentation and complexity favors intermediaries/OTAs, as consumers need assistance in finding what they need without having to become industry experts. For some of the reasons explained in this post, it will be tough for hotels to compete head on against OTAs at what OTAs do best: customer acquisition. However, hotels have direct control on guest experience and on earning future customer loyalty. Competing against OTAs can not only be tough, but expensive. (And the reality is that hotels are also using brand marketing channels, which are traditionally the most expensive. In a marketing mix that includes a high share of brand marketing channels, the cost per booking could be significantly higher). Hotels have a clear edge over OTAs on the fact that customers spend days/weeks experiencing the hotel brand and interacting with the hotel. Focusing more on building unique brands and superior guest experiences seems like a better investment than competing against OTAs in customer acquisition. Hotels should equally strive to earn the loyalty of customers who booked through OTAs. Many hotels treat OTA bookers as second class guests, which is a self destructive strategy towards a growing customer base with significant prescriptive power. Hotel brands are heavily searched terms and hotels can get significant direct traffic. This branded and direct traffic is generally high converting but sometimes the hotel’s booking and user experience is sub-optimal, driving potential direct bookers away from the hotel and towards digital native OTAs who themselves provide a highly optimized search and booking flow. Hotels should make it easy to search and book to avoid giving away customers to intermediaries. Hotels can increase direct booking customers by investing in tools that drive up conversion with smart cross-selling and up-selling. Amazon reported $1.2 billion in “other revenues” (which is essentially advertising sales) in Q3 2017. Amazon’s ad revenue is already 12% the size of Facebook’s and 5% of Google’s, and is growing faster (58% year over year growth in Q3 2017) than Facebook’s (49%) and Google’s (35%). With powerful behavioral, contextual, lookalike, remarketing, demographic and geographic targeting capabilities, Amazon is becoming an increasingly effective advertising platform (take a look at the Amazon advertising pitch deck). In the travel industry, OTAs such as Expedia and Priceline are also developing powerful advertising platforms that enable hotels and other travel providers to target a highly-qualified audience of travel consumers. As part of their online marketing mix, hotels should be actively exploring and testing advertising opportunities with OTAs for better merchandising and positioning. I’d love to hear your thoughts and experiences on this topic!